AS the clock stuck midnight on Sunday 28 April, the new Down Rose 2013 was announced in the fairytale setting of The Slieve Donard Resort and Spa, Newcastle. 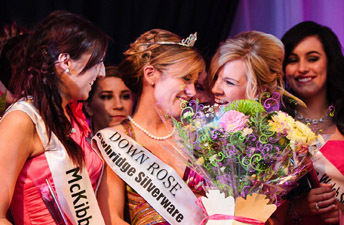 The 2013 Down Rose Sarah McKegney is congratulated by the other contestants. After an entertaining and enjoyable evening with 21 hopefuls taking to the stage wishing to become the ambassador for County Down, the judging panel selected Sarah McKegney from outside Carryduff as the 2013 Down Rose. Sarah is a chartered accountant for Price Waterhouse Cooper and is very involved in charity work in her local community. A member of Bredagh GAC, the 24-year old has recently taken up Gaelic Football and has ambitions to travel the world and to start her own business in the future. In what was a glamorous evening, there was a fundraising raffle for The Southern Area Hospice, The Down Rose’s chosen charity for the year. The charity raised near £600 towards their great work. A representative from Tralee who attended the selection commented on the professional nature of the event and that it showcased much of what County Down had to offer. Down Rose coordinators Gemma Murphy added: “The support for the girls was tremendous on the evening and we would like to thank all the sponsors of the event, especially our main sponsor, The Slieve Donard Resort and Spa, whose luxury surroundings added even more class to the event.”Sarah will now go forward to represent the twenty other girls and her County in the Rose of Tralee International Festival Regional Finals in Portlaoise from Thursday 30 May – Sunday 2 June to bid for her place at the Rose of Tralee International Festival Finals in Tralee in August.